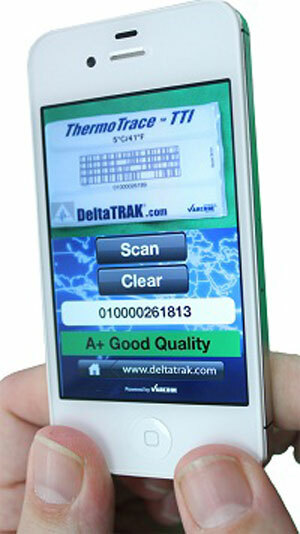 DeltaTRAK's cold chain solution includes the ColdTRAK ThermoTrace TTI labels and the ColdTRAK ThermoTrace TTI Service. The solution provides immediate product quality information to anyone that scans the TTI label with a smartphone-based reader. The free Smartphone application will display a predefined product quality message on the screen of the reader. The message is defined by the ColdTRAK ThermoTrace TTI Service customer and is totally customizable according to their needs. As an example, the message displayed could say "Good" or "Fresh" indicating the product has not experienced any temperature excursions or it might say "Sell Immediately" or "80% Shelf Life Remaining". If the product has experienced extreme exposure to abusive temperatures the message might read "Do Not Sell". The ColdTRAK ThermoTrace TTI Service provides immediate email or SMS text messages every time the TTI label is scanned anywhere in the cold chain, allowing appropriate Quality Assurance /Food Safety personnel to take corrective action if necessary. For the first time the visibility of product quality can be observed by anyone in the cold chain all the way down to the user. Additionally, the customer of the ColdTRAK ThermoTrace TTI Service will receive all the information about the product quality whenever the product is scanned. The TTI label is a low cost single-use barcode label that supports a variety of preset time and temperature events. The label is activated by pulling a tab. On exposure to temperatures exceeding a threshold temperature it then records the event and the barcode is changed. This enables fast and accurate readings and the system can be integrated into any existing cold chain program with minimal integration and implementation difficulty. "With our TTI solution anyone can get product quality information instantly. And, because the labels are low cost it is now practical to track shelf life impact down to the carton level," said Frederick Wu, president and CEO of DeltaTRAK. "DeltaTRAK Cold Chain Solutions give any user along the cold chain instant product quality information by simply scanning the barcode label at any point in time through the cold chain. They are easy to use, extremely accurate and give customers the exact data they need to maintain product integrity and increase safety and shelf life." DeltaTRAK would like to invite all attendees of the United Fresh show and co-located FMI and AMI shows to bring their smart phones to the DeltaTRAK booth to try the technology out and automatically be entered to win an Android Tablet. Prior to the show users of Apple's iPhone can download the application from the application store on their phones by searching for DeltaTRAK scanner. An Android application will be available at a future date sometime prior to the show. DeltaTRAK is a leading innovator of cold chain management, environment monitoring and food safety solutions for the food, pharmaceutical, life sciences and chemical industries. For more information, visit www.deltatrak.com.